We’d love your help. Let us know what’s wrong with this preview of Remedies by Kate Ledger. A captivating new voice in women's fiction delves into the haunted past of a physician's seemingly perfect marriage. Simon and Emily Bear look like a couple that has it all. Simon is a respected doctor. His wife, Emily, shines as a partner in a premier public relations firm. But their marriage is scarred by hidden wounds. Even as Simon tends his patients' ills, and Emily s A captivating new voice in women's fiction delves into the haunted past of a physician's seemingly perfect marriage. Simon becomes convinced he's discovered a cure for chronic pain, a finding that could become a medical breakthrough, yet he is oblivious to the pain that he causes at home. Emily, struggling to move beyond the devastating loss she and Simon suffered fifteen years earlier, realizes she hasn't felt anything for a long time[that is, until a lover from her past resurfaces and forces her to examine her marriage anew. 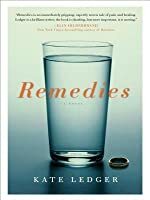 To ask other readers questions about Remedies, please sign up. Intriguing book with a fantastic plot. The characters are a bit hard to latch onto and I was definitely reading more for the story itself rather than because I cared what happened to the people. They were quite unsympathetic despite the tragedy they experienced. Actually I do think Simon’s lack of likeability works because he is buyable as a megalomaniac so his actions make sense in the context of his character. Anyway, despite characters that you would never want to hang out with, I still loved Intriguing book with a fantastic plot. The characters are a bit hard to latch onto and I was definitely reading more for the story itself rather than because I cared what happened to the people. They were quite unsympathetic despite the tragedy they experienced. Actually I do think Simon’s lack of likeability works because he is buyable as a megalomaniac so his actions make sense in the context of his character. Anyway, despite characters that you would never want to hang out with, I still loved this book. It’s beautifully written and quite captivating. 0.5% Grey's Anatomy and 99.5% microwave manual. Blah blah blah (insert medical terminology here), blah blah blah (more medical terminololgy) and lather, rinse, repeat for the rest of the book. The bookmark was pulled after 120 something pages of absolutely nothing happening. South Park did an episode called Smug Alert about these kind people. That episode was about people who drive hybrids and love sniffing their own farts. If you want to read about a group of affluent miserable dickheads where 0.5% Grey's Anatomy and 99.5% microwave manual. Blah blah blah (insert medical terminology here), blah blah blah (more medical terminololgy) and lather, rinse, repeat for the rest of the book. This review has been hidden because it contains spoilers. To view it, click here. I am one of the fortunate readers to receive an advanced copy of Remedies by Kate Ledger through Goodreads.com. It took me a scant two days to read it because I found it difficult to put down. The story is driven by its well fleshed characters. It took me in from the first few pages. I felt as though I was living in the heads of the main characters, privy to their most intimate fears, longings and shortcomings. I have known people who have been rocked to their core by the tragic death of a child. I am one of the fortunate readers to receive an advanced copy of Remedies by Kate Ledger through Goodreads.com. It took me a scant two days to read it because I found it difficult to put down. I have known people who have been rocked to their core by the tragic death of a child. They either pull together or break apart. The Bears began a dance of avoidance from the moment Caleb died. Emily stowed her grief away and tried to ignore it like the plastic box marked ‘Baby’ shelved in her basement. Simon expected her wrath and abandonment from the onset. Her announcement of a separation almost sixteen years later came almost as a relief from the expectation of a punishment long overdue. His avoidance technique was to dive into work and impulsive projects like a zealot. Their daughter, Jamie, became the real loser, ignored emotionally and unable to compete with the ghost of a baby brother who died before she was born. I loved the way it ended. It is left for the reader to decide if there is any hope at all for this family to bond. I will definitely be recommending this book to both of my book clubs. There will be much to talk about with this one. I loved reading this book and was sad when it was over. The story and characters in Remedies are totally engaging - complex, tragic, funny, unique. Kate Ledger's deep understanding of human nature and incredible story-telling skills are really what makes this book special. This is a fantastic book club choice ... there are so many facets of the book to discuss and analyze as well as many issues that touch on one's own experience. I can't wait to read it again! I could not put this book down! The suspense builds as family tension escalates. Several sub plots weave together in unexpected ways. Unpredictable and well written, I give this book 5 stars and will recommend it to all my friends. I am looking forward to the next! Kate Ledger has written a poignant and painful novel about a marriage that is barren of communication and intimacy, left to wither after the death of a six-week old infant named Caleb. Simon and Emily Bear initially married with hopefulness and love, though Emily was as much drawn to the marriage by the potential of Simon's future success as she was by his being her one and only. Together they have a child. When their child dies, so does their marriage. Simon is a physician in general practice by Kate Ledger has written a poignant and painful novel about a marriage that is barren of communication and intimacy, left to wither after the death of a six-week old infant named Caleb. Simon and Emily Bear initially married with hopefulness and love, though Emily was as much drawn to the marriage by the potential of Simon's future success as she was by his being her one and only. Together they have a child. When their child dies, so does their marriage. Simon is a physician in general practice by himself. He has a large and loyal patient following. Emily is Vice President of a public relations firm representing large and important corporations and clientele, an expert on spin. They have a 13 year old daughter, Jamie, who is incommunicative and oppositional. She is lonely and depressed, isolated from her peers. Her parents are each busy with their own worlds and she is left to flounder on her own. Simon spends his days trying to do good, to do the best for his patients that he can. He listens to them, respects their own diagnoses and gets his self-worth by being needed. His specialty is pain relief. Emily lives the corporate life, traveling to conferences, giving talks and attending meetings. Neither of them have much time for anything but their professional lives. Fifteen years before the novel opens they had a child named Caleb who died from meningitis. His symptoms were atypical and there was no way that the diagnosis could have been made early enough to prevent his death. Both Emily and Simon have spent the years following Caleb's death second guessing and blaming themselves for his demise. They each think about what they could have done differently - if only they had recognized the severity of his illness, if only they had checked on him sooner, if only they had taken his crying more seriously. Each lives in their private hell but they never talk to each other about their suffering. They have shut off from one another completely. Simon is an impulsive man who thinks he enjoys hobbies. However, he doesn't follow through with them. At one time, he thought he'd raise orchids but that did not come to fruition. Recently, he wants to take on wine making. He thinks this will impress Emily and bring them closer. He has even engaged Jamie in the excitement of wine making. True to form, however, his attempts at wine making don't pan out. In fact, they further alienate Simon from both Emily and Jamie. Simon is at his highest form when he is helping patients who are in pain. Unlike many doctors, he is willing to prescribe opioids for pain relief, even in large doses. This is a very important aspect of the book. Opioids are the best pain relief known to man. However, many physicians are reluctant to prescribe them because they fear being reported to the licensing board or being viewed suspiciously by their colleagues. Simon trusts his patients' reports of pain and treats them all with respect. He is willing to believe them and prescribe strong medicines to improve their quality of life. At one point in the novel, Simon believes he has found a cure for pain. It is sad to view his naive attempts at getting his colleagues to pay attention to his findings. He has no idea how to market his research. It is further ironic that he is married to an expert in spin who is not even interested in listening to Simon's findings. Simon tries over and over to get Emily to listen to him but she has no interest at all. Both Emily and Simon are their own worst enemies. Each of them live in a world of denial, repression, sublimation and self-blame. They have lost the ability to reach out to each other or anyone else. They are stuck in their own excruciating pain - a pain that has no cure and no relief. This is a wonderful novel that demonstrates how two people can live together and be completely isolated from their inner lives and one another. Kate Ledger has written a strong and powerful debut novel, one that holds the reader in its grip. I was lucky enough to win an advanced copy of this book from the First Reads program on GoodReads. This is the debut novel for Kate Ledger, and I hope it won't be her last. This story is reminiscent of Ordinary People in it's focus on a family dealing with a personal tragedy. but it adds a modern spin involving two strong career professionals grappling with this challenge. The first scene in the book arrives with graphic clarity. It might put off some readers, but in those first few pages we get I was lucky enough to win an advanced copy of this book from the First Reads program on GoodReads. This is the debut novel for Kate Ledger, and I hope it won't be her last. This story is reminiscent of Ordinary People in it's focus on a family dealing with a personal tragedy. but it adds a modern spin involving two strong career professionals grappling with this challenge. The first scene in the book arrives with graphic clarity. It might put off some readers, but in those first few pages we get a clear insight into Simon Bear - Doctor, Husband, Father, Flawed Human. Throughout the novel we see Simon trying to atone for his flaws while his wife Emily uses her PR skills to explain away the problems, and realizes that neither of them have ever dealt with their personal tragedy. Once through the opening, the book builds steam, and by the middle the plot is flying by. Ledger creates compelling, modern characters. While I might not agree with their choices, it's clear how they arrive at them, and that their actions are consistent with their situation and values. There are several heart-wrenching scenes, especially as Emily comes to terms with her role in their relationship. If I have a quibble with the novel, it's the end. I fully support the author's decision not to wrap things up with a bow. However, in making this decision, she has left a few too many plot lines open. Resolving a few items would make the decision to leave the larger points open much more meaningful. As it is, the book is great for 90%, but you could stop and any time since there won't be a resolution. This was a Goodreads Giveaway win. I dislike books that 1) Have lengthly descriptions of meaningless things and 2) Throw around big words and long narrations about topics that a normal person does not know/care about. This book did both of these things in the first few pages (Description about eating an apple on page 7 and narrative of medical terms on page 24). That almost immediately turned me off (not to mention the somewhate graphic first two pages which seemed completely unnecessary). It see This was a Goodreads Giveaway win. Writing was decent but could not overlook gaping holes in research storyline. I work in biomedical research and have for many years so maybe my low ranking is unfair as the story wasn't about regulatory compliance. If there had just been a little bit of acknowledgment of the clinical trial rules, probably would have rated higher. okay so this was not an uplifting book, but it was so well written and the characters were so interesting. I can't say any of them were really likeable, but it felt like their histories were really the reason for who they were and they deserved a pass. This was definitely a well-thought-out story. This book should have been a 5 star read for me. I have a chronic pain disease, my first child died as well, and in general, I like a story with a medical storyline. While I could sympathize with Emily, I couldn't stand Simon. I could not find one thing I liked about him, and unfortunately, it ruined the book for me. I'd really like to give this 1.5 stars. I didn't find the characters particularly interesting and the storyline was sort of boring to me. I sort of just hoped I would finish it quickly. 2 out of my 6 Goodreads friends have already read this, but I wouldn't recommend it to the rest of you. Just a so-so book about a marriage in crisis. I didn't find either of the main characters likeable, and some of the plot lines just didn't seem plausible. In addition, this book could have benefited from some fact checking - the town is 'Glen Burnie' and not 'Glenburnie'. A compelling story but poor resolution. A little surprised teh characters didn't make more of an effort to connect with each other. Daughter problems seem classic and not that important to the father. I picked this up because I thought I had read a good review of it in the New Yorker or something. About 20 pages in I realized I must have been mistaken. The writing felt like something I remembered from a high school creative writing class. Would have been one star but I'm feeling charitable. I really tried to like this book, and read to the bitter end (nearly 400 pages), hoping I would come to like it. But I found the characters both sad and unlikeable, they engage in far too much hand-wringing, and participate in a plot I found hard to believe. Just did not do it for me. Novel told in alternating sections by a husband and wife, both unsympathetic and self-obsessed characters in a miserable marriage. The writing wasn't bad but just couldn't get into the plot or the characters. Started out reading this one, but couldn't get past the first 20 pages. The main character, seems to much into himself and all about why he didn't hire his new nurse because she was young and pretty. Can see where this is headed and don't care to take the journey. An in-depth, intricate look at a troubled marriage. I loved the detailed characterization and the twists and turns of the plot. I'd recommend it for sure! It is a MN authors first book, as she describe, written over time and it shows. I was disappointed, left me with... nothing. Too long. The narrative is 90% expository, which grates after the first section. I liked the Dr’s musings on chronic pain, however. Very accurate. I received this book as an ARC from Penguin Books. This is Kate Ledger's first novel and the book hits stores today, August 20, 2009. Although this was a little slow in the beginning, it did become hard to put down towards the end of the book. Rather than chapters, the author used 5 Parts to divide the story, jumping between Simon and Emily's character as the story was told. As a reader, I like to have little breaks in the story, where if I need to put it down, I know I can finish a chapter in a I received this book as an ARC from Penguin Books. This is Kate Ledger's first novel and the book hits stores today, August 20, 2009. Although this was a little slow in the beginning, it did become hard to put down towards the end of the book. Rather than chapters, the author used 5 Parts to divide the story, jumping between Simon and Emily's character as the story was told. As a reader, I like to have little breaks in the story, where if I need to put it down, I know I can finish a chapter in a few pages. With the parts in this story that became hard to do. It also made it difficult to stay with the story when it was 50-100 pages before going back to the other character. The story dealt with marriage, infidelity, parenting, medical issues, death, rejection, and love. All through the story, I kept telling myself that the character, Simon, just needed to feel loved. After the death of their infant, the relationship between Simon and Emily fell apart and neither one of them ever dealt with their child's death. Instead they threw themselves into their careers and eventually ignored their other child. No wonder they were all a mess in the story. It was quite heart-breaking to read, but also frustrating. I just wanted to shake the two of them and say "Grow up and talk to each other!". The story ended leaving you hopeful, but I still would have liked it to be a little more tidied up. The author's descriptions of feelings in the story were right on and made the reader feel them right along with the story. I liked her description of Emily's face....noticing that her eyes had lost their stars, a wrinkle of consternation etched on her forehead, her lips turned downward...Emily wondering when that had happened. I also understood her part of the story where they got lost driving and the daughter says "we are off the map!" and how Emily realized it described them quite well. Their family was "off the map" and who can't admit at times to being "off the map" yourself...an accurate description. I was saddened by Simon visiting his parents and practically begging for love from them. I imagined the scene and just ached for Simon (one of the few parts of the story where I felt sorry for him). He was begging for acknowledgment and love from them so badly and he just couldn't get it. How that played out in the rest of his life was remarkable. I learned about "life's goodies" from this story and will try to look for those in my life and not waste them. I also learned about relationships and "like nerves...they can get injured, but can regrow". How true. “Remedies” by Kate Ledger, published by Amy Einhorn Books. Simon Bear is a caring Doctor; he treats pain and prescribes medicine that will alleviate the pain. He is very conscious of his patients, maybe to a fault. His wife, Emily, is a working Mom that has a very good position with a Public Relations firm. They have a young daughter, Jamie, who is a problem, a problem that may be due to her parent’s inability to be parents. Some of “Remedies” by Kate Ledger, published by Amy Einhorn Books. Simon Bear is a caring Doctor; he treats pain and prescribes medicine that will alleviate the pain. He is very conscious of his patients, maybe to a fault. His wife, Emily, is a working Mom that has a very good position with a Public Relations firm. They have a young daughter, Jamie, who is a problem, a problem that may be due to her parent’s inability to be parents. Some of this problem could be due to the loss of their baby boy. A missed diagnosis that has plagued both Simon and Emily over the years, a tragedy that has seen the two of them drifting apart and looking for solace somewhere else. Simon stumbles on a drug that could be the answer to chronic pain disorder. A simple cure that does not seem to have serious side effects and is non-addictive. In an effort to get recognition he starts treating his patients in the hope of not only curing them but gaining the respect of being a good doctor. He becomes so obsessed with his findings that he draws farther apart from both his wife and daughter. Emily, who has struggled with her marriage since the death of their child, finds relief in a boyfriend from her past. She forsakes her family as she pursues her new love. Jamie feels that she is being left out as her mother and father pursue their own lives, decides the bad girl routine may give her the recognition she wants and needs. She has even taken it to the point of a self piercing that leads to a serious infection. Simon and Emily find their lives in turmoil as Simon is investigated for malpractice and Emily discovers her new lover may not be the answer to her problems, and Jamie, well she is still caught in the middle. An excellent read that leaves the reader wondering about the consequences of pursuing personal goals at the expensive of all else. This is a striking picture of a marriage gone very wrong, nominally stemming from the death of an infant child fifteen years before. However,there is a strong sense that the marriage would be just as off-track even if the child had lived a normal life. I don't much like one of the main characters, Emily, who is not particularly sympathetic, but I wholly dislike the other, her husband Simon,a doctor who envisions himself as his patients' hero. What an ego - how self-important, self-centered, and This is a striking picture of a marriage gone very wrong, nominally stemming from the death of an infant child fifteen years before. However,there is a strong sense that the marriage would be just as off-track even if the child had lived a normal life. I don't much like one of the main characters, Emily, who is not particularly sympathetic, but I wholly dislike the other, her husband Simon,a doctor who envisions himself as his patients' hero. What an ego - how self-important, self-centered, and compulsive is is possible to be? Even by the end Simon does not seem to have figured out much of this. The author has done a strong job of limning the characters, even though they are not sympathetic. There are some parallels to Job - Simon would likely see himself that way and I am somewhat surprised that he does not reference Job, (in deference to the author, Simon is enough over the top to not try to work this in) since he does see his troubles as foisted on him, not self-created, but certainly absolutely everything in his life comes crashing down. He is not like Job, though, certainly was never a humble righteous man. The ending scenes take place during a Yom Kippur service, and it seems that he finally sees how pathetic he is, making atonement - but shortly thereafter is confident that he will come up with the right words to get his wife to come back. It does not seem that he has changed at all. One aspect of the story that was particularly interesting to me was Simon's relationship with his parents. He thinks that they refuse to accept his help because they fear death, and accepting it would be their acknowledgment that "they're capable of dying". Exactly the opposite is much more likely - they are aged and have accepted that they will die, hence do not want or need his help, and are simply focused on leading their lives as is. Chronic pain in all of its forms is explored within the pages and within the lives of Simon Bear, a much loved and respected physician; Emily Bear, Simon’s wife; and their daughter, Jamie. The Bears are suffering from deep scars over the loss of their infant son, Caleb, fifteen years earlier. That tragic loss has caused them to block out their emotional pain, chronic pain that lingers deep wit The novel, Remedies, by Kate Ledger, is a very in depth and intense read on the subject of chronic pain. Chronic pain in all of its forms is explored within the pages and within the lives of Simon Bear, a much loved and respected physician; Emily Bear, Simon’s wife; and their daughter, Jamie. The Bears are suffering from deep scars over the loss of their infant son, Caleb, fifteen years earlier. That tragic loss has caused them to block out their emotional pain, chronic pain that lingers deep within the recesses of their hearts. That Simon, a doctor, was unable to diagnose and save his infant son, only enhances his grief, sense of loss and void from it, and enhances the continuing emotional pain. Emily’s pain, is also chronic, and she emotionally withdraws. Thus begins the story of a marriage conflicted with pain and lack of communication. This was a hard one to review and I wish I could have given it 3.5 stars. I wanted to love this book--the author's children go to preschool with my sons and she seems like a nice person--but in the end I liked it. The story follows the Simon and Emily Bear, a married couple with a teenage daughter. Before their daughter was born, they had a son who died when he was six weeks old and they never dealt with the pain of that loss. Simon is a doctor obsessed with healing his patients' pain and I found it hard to get into his character; he often felt like a bundle of needs and emotions instead of a real person. Emily is a pr executive who falls into an affair with an old lover. I enjoyed the parts of the book in her voice. The challenge with this novel is that it is unrelentingly sad. So many small and large tragedies happen to this family and I felt the story needed more cheerful moments. On the other hand, Ledger's writing is powerful and many of the scenes moved me to tears. This novel presents a couple that, from the outside, ostensibly lead a charmed life. Simon is a physician with a thriving practice and Emily is a successful businesswoman; however, their relationship was irrevocably damaged by a tragic incident early in their marriage. Their only child is lonely and unparented. When Simon seems to find a cure for chronic pain, he becomes obsessed with its promotion while Emily pursues a relationship with a former lover under the guise of business obligations. Wha This novel presents a couple that, from the outside, ostensibly lead a charmed life. Simon is a physician with a thriving practice and Emily is a successful businesswoman; however, their relationship was irrevocably damaged by a tragic incident early in their marriage. Their only child is lonely and unparented. When Simon seems to find a cure for chronic pain, he becomes obsessed with its promotion while Emily pursues a relationship with a former lover under the guise of business obligations.